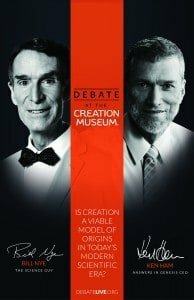 On February 4, 2014, Ken Ham and Bill Nye held a debate on whether creation is a viable model of origins. I have been asked for my views about the recent debate. This article contains a review of the debate and some thoughts about it. During the debate, Ken Ham did not have time to answer all of Bill Nye’s questions. Since the debate, I have seen answers to many of them on Facebook and elsewhere online. You can find many debate and post-debate resources on the Answers-in-Genesis website. First, I would like to thank and applaud Ken Ham for his faith and courage in taking a stand on the Word of God and engaging Bill Nye in this public debate. I expect God will reward Ken’s faithfulness, but in the meantime, he has been receiving a lot of flak and hate mail from the world. Evolutionists can be quite intolerant of those who promote creation. The saddest part are the many people who call themselves Christian, who not only believe in evolution despite its contradiction of God’s Word, but also criticize those who believe the truth revealed in the Bible. I would also like to congratulate Bill Nye for being willing to enter into a public debate with a creationist, particularly in the Creation Museum. Many evolutionists refuse to debate creationists, saying they do not want to provide them with a public forum or lend them any credibility. The evolutionists control the schools and the media, so they have little to gain by a public debate. They do potentially have something to lose though. So I applaud Mr. Nye’s courage and fairness in entering into this public discussion with a creationist. 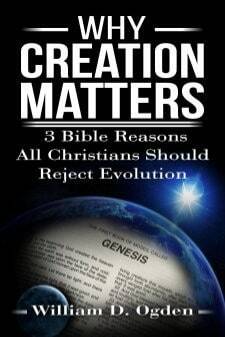 Overall, I think Ken Ham did a great job of presenting and defending the Biblical teaching of creation. His presentation managed to include brief presentations of the gospel. He also made an excellent case for why it is not necessary to believe evolution in order to be a good scientist or engineer. As proof, he even introduced some very successful scientists who believe in a literal 6-day creation. Ken makes a distinction between “observational science” and “historical science.” “Observational science” is what was historically known as “science,” and it uses what is known as “the scientific method.” It has to do with what can be observed, tested, and repeated in the present. This is the basis of all our scientific and engineering progress and achievements. One of the primary assertions of evolution is a denial that anything supernatural ever happened, that everything has to be explained in terms of natural processes based on the physical laws of nature as we observe them in the present. This assumption automatically excludes the possibility of God or creation by God. Ken did not have time to elaborate on all of these predictions, but he talked about the “KINDs.” He said creationists believe that in most cases, the “kinds” correspond to modern classification methods at the Family level. This greatly reduces the number of animals needed on the ark. Evolutionists believe in a tree of life that all branches out from one single origin. Based on Bible “kinds,” creationists believe in an orchard of kinds that branch off into species. Ken pointed out that there is more variety in dog skulls than there is in the skulls of the finches Darwin used as evidence for evolution. But no one uses dogs as an example of evolution because we know they are all one species of dogs despite their great variety. Creationists would agree with the variations within kinds, which can be observed. But evolutionists use these minor variations as evidence of large variations between kinds and for their tree of life theory, even though there is no evidence of transitional forms between kinds. This is not science. Bill Nye used the lack of the evidence he would expect to see, as evidence against “Ken Ham’s” creation. He touched on tree rings and ice cores as evidence of ages over 4,000 years old. He used the rock layers seen in the Grand Canyon and elsewhere. He talked about the lack of Kangaroo fossils outside of Australia. He did not accept that plants could be submerged during a year long flood and produce plants after the flood. Bill Nye denied the feasibility of Noah being able to build a large wooden ship without ever building one before. He gave an example of a wooden ship named the Wyoming, a 6-masted schooner, built in the early 1900s by expert ship builders, but it sank. He said if these modern, expert ship builders could not do it, then Noah and his inexperience family could not do it either. Of course there is no proof that Noah was inexperienced, and there is no reason to think that Noah built the ark without hired help. Bill Nye stated that “Ken Ham’s creation model” cannot make predictions. Even though Ken Ham had already pointed out many predictions (as listed above). Bill Nye made a big deal about a prediction of where “traditional” scientists thought they might find a transitional form between fish and land animals. When they looked there, they found the fossil of an animal they named “Tiktaalic.” Evolutionary scientists have jumped on this as a possible transitional form, but the partial skeletal remains cannot prove that it was a transitional form or that evolution occurred. ICR has published articles that debunk these claims. Bill Nye explained the origin of and evidence for the big bang theory. He talked about the fact that the stars are moving apart. He talked about “cosmic background energy.” He also asked how there could be billions of stars more than 6,000 light years from earth if the universe is only 6,000 years old. However, the big bang theory has problems with distance and time as well. The universe is so large, that there is not enough time for light to travel from one side to the other or for the background radiation levels to become uniform even with the billions of years of age assumed by evolutionary cosmologists. Just because we as finite beings with limited knowledge do not understand how an all-powerful, infinite God did something, does NOT prove He didn’t do it! The amount of parent vs daughter isotopes in the rock when it was formed must be known. But there is no way of knowing. The rate of radiometric decay has always been constant. Radiometric dating not only requires unproven assumptions, it does not yield consistent results. There are several different dating methods that use different elements. If one rock is tested using multiple methods, widely different ages may result. In addition, rocks from modern lava flows have been tested as millions of years old. Radiometric dating can also be used to demonstrate that rocks generally considered millions of years old are really only thousands of years old. Carbon 14 can be measured in diamonds despite its relatively short half-life, which means the diamonds have to be less than 100,000 years old. As a result of land erosion, salt is added to the oceans faster than the rate it is removed. The oceans are not salty enough. The moon is moving away from the earth at a rate of about 4 cm (or 1½ inches) every year. At this rate, the moon and earth would have been touching less than 1 billion years ago. The intensity of the earth’s magnetic field has been measured since 1835, and is decaying at an exponential rate. Based on this rate of decay, the strength of the magnetic field would double every 1,400 years as you go back in time. At that rate, 10,000 years ago the magnetic field would have been so strong it would have destroyed the planet. So based on the decay of the earth’s magnetic field, the earth cannot be more than 10,000 years old. But Bill Nye and other evolutionists have an amazing ability to ignore scientific evidence that contradicts the theory of evolution. In recent years, soft tissue has been found in many fossil dinosaur bones. It is well known that soft tissue decays rapidly so it could not survive millions of years. However, instead of drawing the obvious conclusion that these bones could not be as old as previously thought, evolutionists now accept that soft tissues must be able to survive 60-million years. That is not science; it is blind faith. During the debate, Bill Nye said he would consider the possibility of creation if a fossil were found swimming up between layers. Since animals that are rapidly buried by sediment quickly die, the swimming scenario cannot really happen, and there is proof that fossil sediments were deposited quickly. Polystrate fossils are fossils of tree trunks and other vertically oriented stems that protrude up through multiple layers of sediments. These fossils demonstrate the rapid nature of burial and disprove the evolutionary assumption that each grain layer took a year to form. Bill Nye used the Grand Canyon as an example of the “traditional” view of geological ages. He said it was unreasonable to think the layers could have been deposited quickly or the canyon eroded rapidly. Bill Nye also said he was in Washington state when Mt. St. Helens erupted and that he is on the board. He should be aware then that up to 400 feet of strata have formed there since the eruption in 1980. A 25 foot thick deposit was formed in one day on June 12,1980 by pyroclastic mudflows. Bill Nye repeatedly expressed concern about the competitive future of America. He said we need scientists and engineers to advance our technology. He thinks only evolutionists can do that. However, creationists believe in the same physical laws as evolutionists. The disagreement is about what happened in the past. What one believes about origins is irrelevant to one’s ability to use the scientific method and apply the physical laws of nature as we understand them in the present. The defining moments of the debate occurred around the 2-hour mark during the question and answer time. When Bill Nye was asked what the origin of the matter in the universe was, he replied that he did not know, it is “a great mystery.” Later, when Ken Ham was given the opportunity to reply, he said, “There is a Book” that tells us where matter came from, and explains the origin of everything. In the next question, Bill Nye was asked about the origin of consciousness. 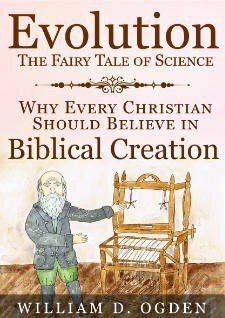 He again answered that he did not know and that it is “a great mystery.” When Ken Ham replied, he again reminded Bill Nye, “There is a Book” that provides the answer. God created man in His image. Ultimately, the debate was really about Authority. What / Who is the source of ultimate truth? Is it Bill Nye’s “reasonable man” or the Word of God as recorded in the Bible? Both men were asked what one thing they base their beliefs on. Ken Ham answered the Bible. Bill Nye said he was in love with the joy of scientific discovery. Ken Ham and those who believe the Bible rest on the firm foundation of the unchanging Word of God. Bill Nye and those who believe in evolution reject the authority of God’s Word, preferring instead to rely on the ever changing theories of man.